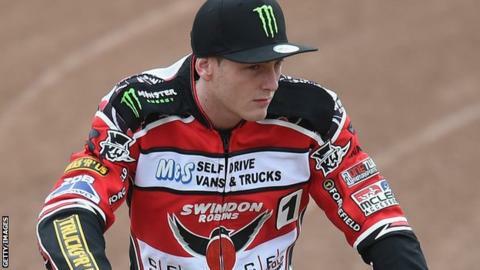 Speedway rider Darcy Ward has undergone spinal surgery after being involved in a track crash in Poland on Sunday. Ward, currently on loan to Elite League club Swindon from champions Poole Pirates, was riding for Polish side Zielona Gora against Grudziadz. Zielona Gora's club doctor confirmed the Australian is breathing on his own and is aware of his surroundings after a two-and-a-half hour operation. The 23-year-old's condition is described as stable. A full prognosis is not likely to be known until Wednesday. In a statement issued earlier, Poole Pirates said Ward has "no lower-body feeling at this time" after the crash on Sunday. Pirates team manager Neil Middleditch and fellow Australian and Poole team-mate Chris Holder have flown to Poland to offer Ward support. Club promoter Matt Ford said: "The thoughts of everyone associated with Poole Speedway are very much with Darcy. "I would like to assure everyone that as a club we will do everything we possibly can for Darcy during this difficult time." Australian Ward recently returned from a 10-month ban after failing a breathalyser test in August 2014 and signed for Swindon in July. Swindon owner Terry Russell described the accident as "tragic". "We can only hope and pray he comes through it," Russell told BBC Wiltshire. "He is such a star rider, he's only been back from his ban for a couple of months and he recently stated how much he's enjoyed getting his life back. It's tragic."